The Abacus training is incorporated as an integral part of Mathematics curriculum right from second standard. 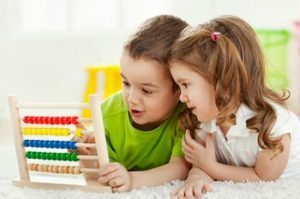 The broad aim of the Abacus is to train a child to enable him/ her to maximize the use of brain power. It results in improving the child’s ability to solve mathematical problems as well as enhancing child’s attention span, memory, analyzing power, observation, listening and logical reasoning, thus leading to all-round development. Smart class is an innovative methodology which aims at transforming the teaching techniques from a traditional, industrious method of verbal explanation to a very interactive and graphical presentation making teaching more interesting to the teachers and learning smooth and fun for the students. We understand the importance of a classroom in a student’s life. Our classrooms at Samriddhi help create an inviting and a nurturing learning environment. They are designed to stimulate the mind and promote learning experiences. Everything within the classroom is curriculum focused. This includes furniture, teaching aids, display boards, wall decorations, visuals, and even what can be found on a teacher’s desk. Our furniture and teaching aids are child friendly and age appropriate, keeping each development stage of a child in mind. Study of Mathematics facilitates a way of thinking, a way of organizing a logical proof, a way of reasoning. It gives an insight into the power of human mind. This forms a very valuable discipline of teaching-learning programs of a school. To facilitate directed discovery, learning and develop analytical thinking, we have provided the students with well-equipped Mathematics labs where experiential learning takes place. Our highly qualified and experienced Mathematics faculty imparts a strong logical orientation to the entire learning experience. Laboratory activities provide experience with phenomena, a starting place for the systematic development of student’s ideas and a testing ground for the predictive power of their reasoning. At Samriddhi School laboratory activities are designed to engage student’s minds, so that students may acquire skills and confidence in the process of learning. The Science lab experience provides opportunities for students to interact directly with the material or with data drawn, using the tools, data collection techniques, models and theories of science. Our labs are well equipped with the latest apparatus. The school spends liberally on buying new equipment. Students in a hands-on-science program will remember the subject matter better, feel a sense of accomplishment when the task is completed and be able to transfer that experience easier to other learning situations. We at Samriddhi believe in giving a Global Exposure to our students and make them reach the targets in their life. A language lab creates a learning environment much more effective than traditional classrooms enhancing the capabilities of students and allowing a high degree of immersion and attention to diversity. The use of the language lab allows students to have access to the information quickly and easily developing many types of classroom exercises, personalizing the learning process, encouraging creativity, innovation and training. Language laboratories also favor a high degree of skill development, team and collaborative work eliminating socio-temporal barriers since information is not found in a particular and specific place and at the same time, they foster digital literacy responding to new educational and social needs. In the present times, knowledge cannot confine to textbooks. We are part of a world where education goes beyond school books. Samriddhi School understands the current trends and believes in leaving no stones unturned to educate its learners in all areas. ICT is an integral part of the curriculum. It is taught as a stand-alone subject from class I onwards and also woven throughout the curriculum all through the student’s schooling. We have information and communication systems to assist learning. The school aids them with Computer studios that have high-grade computers and multimedia projectors, interactive smartboard, a 3D printer and carefully monitored and filtered internet connectivity. Each child is provided with his or her own workstation and access to an individual computer. We spare no effort to prepare our learners for the global society and IT driven world. An integral part of our teaching system, the career development and counselling sessions conduct aptitude tests, interest checks and interactive activities designed by expert counsellors. This helps the learners understand their forte before choosing a career. Some of our learners have special physical, social, emotional or academic needs. They require a special program of structured support and work. With the consent of parents, we keep those learners in the guidance of professional counsellors who help them deal with their temporary and long-term difficulties. The school has a health unit that looks after the wellbeing of the learners. The school has a tie up with Grandee Hospital, which monitors the health of our learners. A full-time qualified nurse is on duty during the school hours to look after the infirmary and attends to the first aid needs of the learners. The school provides a spacious library with a well indexed stock of story books, text and supplementary books, newspapers and magazines. It opens the doors of world of reading to the students. There is also a Resource room attached to the library with more computers available for student access. A modern well-stocked cafeteria provides hygienic and nutritious lunch and snacks to the children and teachers as well. The Cafeteria provides light nutritious snacks at reasonable cost. It is accessible to children during their break. The school’s Android and iOS app lists daily menus and nutritional information, giving students the chance to plan their meals with ease. Similarly the smart payment system makes students free from carrying cash every day. The school provides transport facilities on specified routes. These buses operate under the safety vehicle scheme which ensures that your child reaches home safely and securely. Parents and guardians can track the vehicle movement from their mobile phones with school app and learn the precise location of school buses.